Today I was busy at my "Make-a-Dish Foundation" (it's really not a foundation...but simply what I refer to it as). I've been trying to recreate grain free versions of recipes that I've been sent by followers. Some of these recipes are simply regular recipes that they have come across and thought looked good and they've simply asked for my help in reworking them. Some of these recipes are old family favorites, some of which have been passed down by multiple generations, and they are trying to see if they can still find a way to enjoy these treasures in their new grain-free, low sugar lifestyles. As many of you who have tried retooling recipes before know, some are easier than others to swap out an ingredient or two. Some recipes require a bit more tinkering and it isn't just a matter of replacing one kind of flour with another. Sometimes the ratios and blends have to be reworked and sometimes liquids and fats used in the original recipes need to be tweaked as well. The more you do it, the better you get at doing it. Unfortunately though, most of the ingredients us grain and sugar free folks use are quite a bit more expensive than their regular version counterparts (think basic flour and regular sugar, for example). So, it is something you want to experiment with on a smaller scale first, "just in case". Most of the time though, even your "mistakes" are salvageable and not total losses. Last week, I recreated a special Bundt cake recipe requested by the husband of one of my regular followers (she was celebrating a special birthday and he wanted to surprise her). The tricky part of recreating special recipes for people when you've never actually tasted the original version yourself...well, it is sometimes hard to know if it needed a little more this or little more of that. If it tastes good to me and I would make it again, I consider it a success, but if it doesn't taste like what they remembered, then you hope you at least got it close enough that they can make minor tweaks to get it just right. When converting recipes for "regular" baked goods to "grain free" baked goods, it rarely is an exact match because the texture of the flours that are used along with the drastic difference in the way grain free baked goods rise (or don't rise) without the benefit of gluten in them is pretty significant...so we simply manipulate them a little bit to get them as close as possible. Today I worked on two different recipes, one was from "Anne" who sent me a "peach and blueberry yogurt cake" recipe that she wanted a grain and gluten free version of. 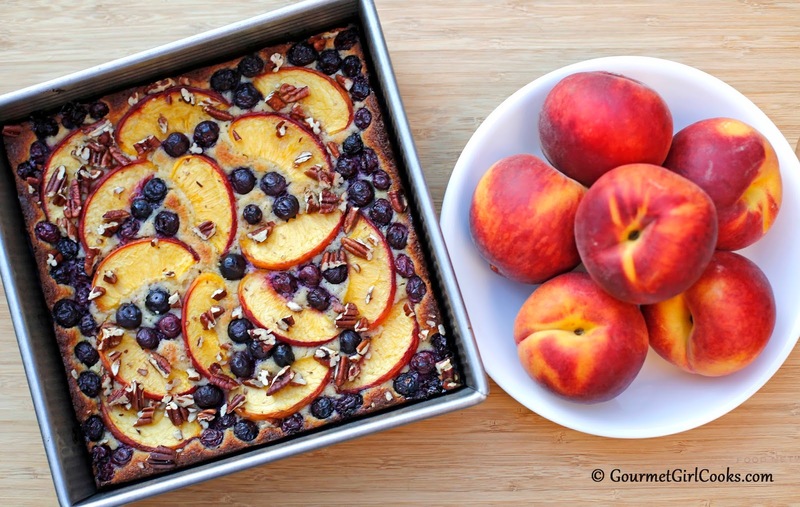 The recipe looked really good and I just happened to already have been planning something along those lines using both peaches and blueberries because I think they go so well together and they also scream summertime. Besides, what kind of Georgia gal would I be if I didn't try to at least include one peach recipe in my repertoire! So, I made my own grain free version of the cake recipe and added my little tweaks and alterations. Since I was already using Georgia peaches (well, actually these were from California), I knew I needed to toss in some Georgia pecans, too, so I could thoroughly represent my state. I also added a bit of lemon zest to it, simply because I could. I promise to make this cake again just as soon as I get some ripe Georgia peaches in my hands. 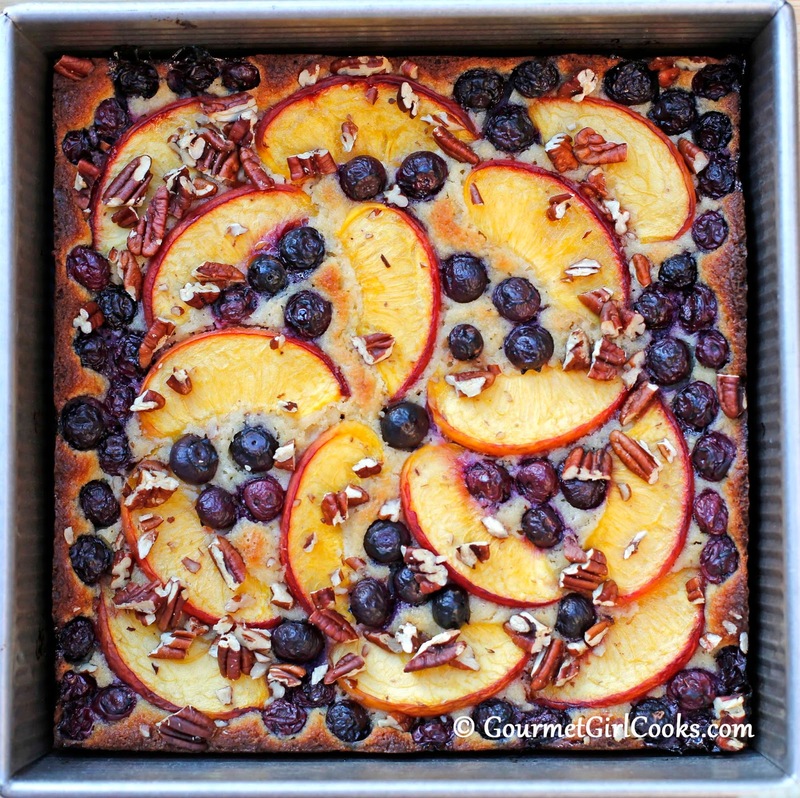 This cake would be great for breakfast, snack or dessert. It's moist and not overly sweet; you can increase the sweetness if you prefer. 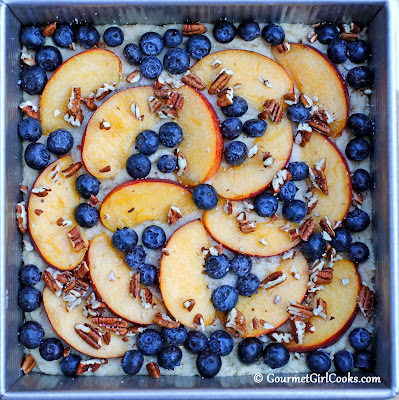 It was the perfect level of sweetness for me and allowed you to taste the peaches and blueberries. So, Anne...I hope you enjoy this grain free, gluten free, sugar free version of the recipe you sent me to look at for you. In order to keep the carbs low, I used 1 large peach (instead of 2). I simply sliced it thin to cover the top of the cake. 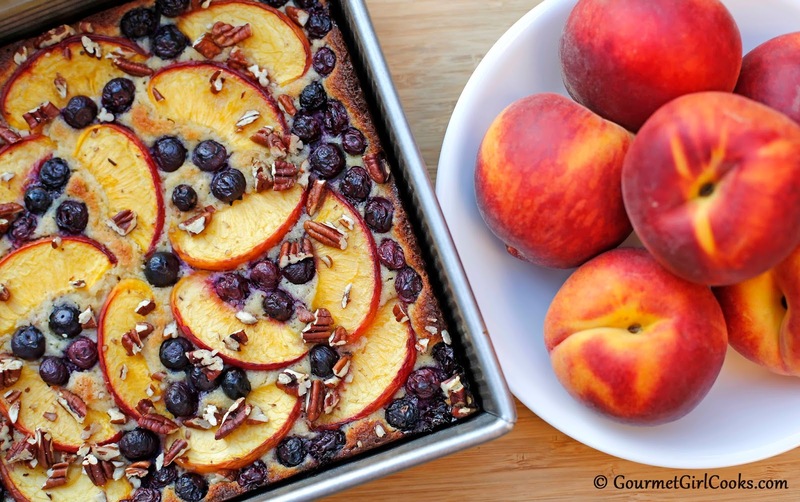 The one peach only adds about 14.5 net carbs and 14.5 grams of sugar to the entire cake recipe which should serve approximately 12 (adding about 1 carb and 1 gram sugar per serving). The approximate total net carbs per serving are 4 net carbs and less than 2 grams sugar. The other recipe I worked on today was more special because it had been handed down generations from Grandmother to mother to daughter. I hope to post it tomorrow. Enjoy! 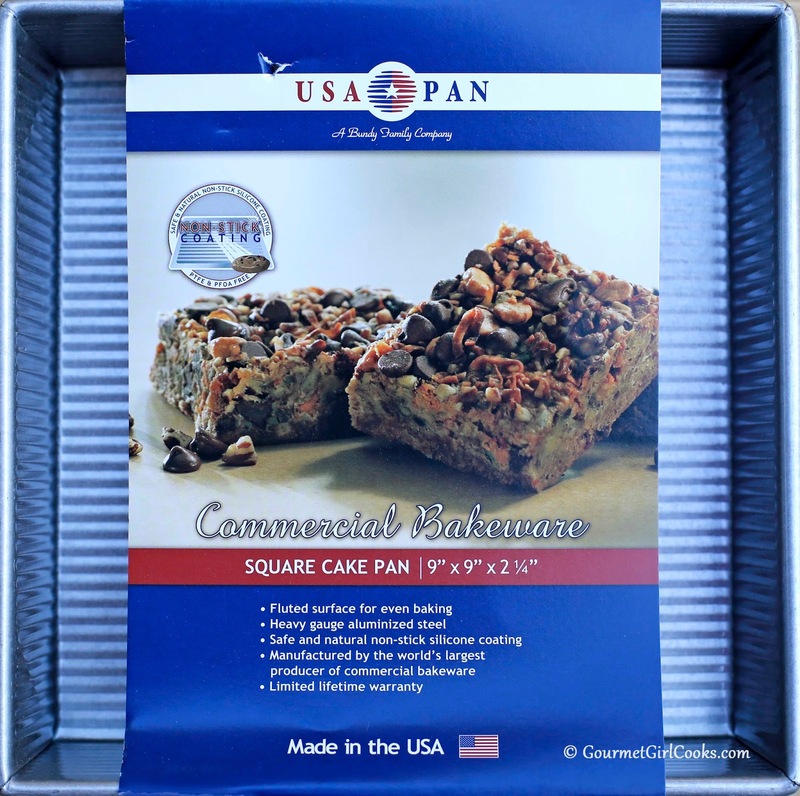 Preheat oven to 350 degrees F. Lightly grease a nonstick 9-inch square cake pan (or 9-inch round cake pan) and set aside. Sift first 4 dry ingredients into a medium bowl. In a separate medium bowl, cream butter with a rubber spatula or wooden spoon; carefully fold in powdered sweetener and eggs just until combined. Beat with a hand mixer on medium speed for about 2 minutes or until smooth. Add vanilla, lemon zest and yogurt. Beat an additional 1 to 2 minutes or until mixture is light and fluffy. Pour wet mixture into dry mixture and stir just until combined. Beat on low speed until thick and smooth and evenly combined, about 1 minute (batter will be thick). Pour batter into prepared batter and smooth out evenly with a rubber spatula. 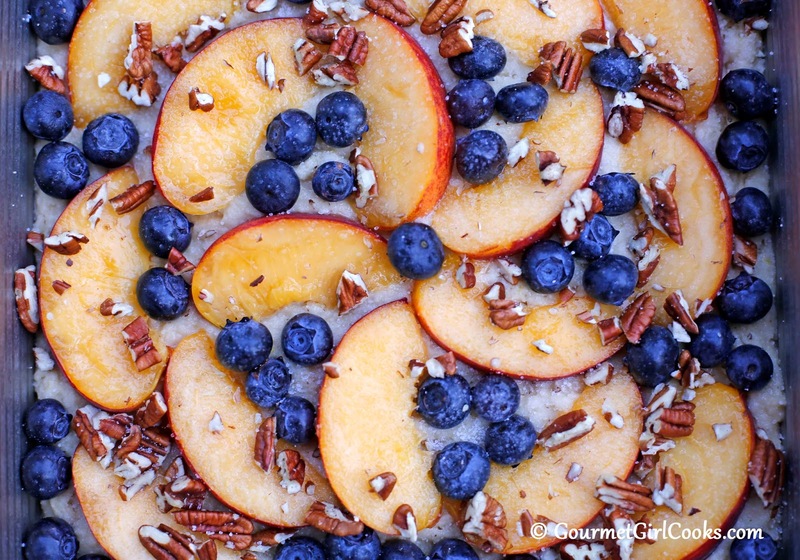 Arrange peach slices; scatter blueberries and pecans over top. Sprinkle with granular sweetener, if desired. Bake for 45 to 50 minutes, or until a toothpick inserted near the center comes out clean. Cool about 1 hour. Refrigerate any leftovers. *Note: If you prefer a sweeter cake, increase powdered sweetener to 1 cup or add a few drops of liquid stevia to the batter, to taste. Thank you, GG! I'm so glad you liked the idea of this recipe! Peaches, blueberries, and yogurt has to be a winning combination. I'll be shopping for peaches this week. I'll be sure to let you know how the recipe worked for me. Again, thanks! We have white peaches in our yard. They are gorgeous looking, plentiful and super sweet--but no flavor. Like a beautiful looking person without a soul ! I don't usually look at a recipe and want to change it but this one I did! Maybe because I'm blueberried out but I thought Peach Melba! Use raspberries instead of blueberries, almonds instead of pecans and there you have it! (and skip the lemon) What do you think? Thanks!! LOL - "Make-a-Dish-Foundation" - very clever! You have been fulfilling lots of wishes - errr, make that dishes, lately. They all sound good! Another winning recipe. Do I assume 9 servings on this cake?? Thanks for all your hard work. 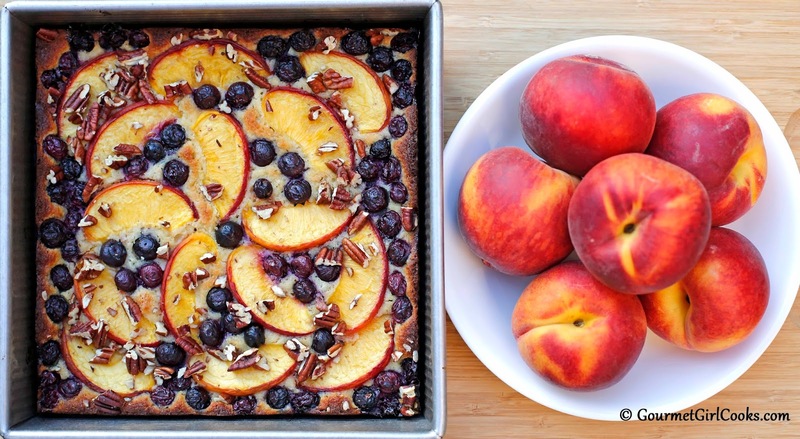 Wow, this is gorgeous - I just got a twenty pound box of peaches and want to slow down and use some of them before tucking them into the freezer for later. THis looks so perfect. Cant wait to try this, could you use honey or agave as the sweeter, if so how much would you use? Thanks for sharing! I'm sure you could but you would be adding an additional wet ingredient. You would probably need to adjust the dry ingredients by increasing them a bit, depending on how much you added. Thanks!